LEAH floated in space, and then suddenly in front of her she saw The Doctor, taking his place in a perfectly formed comic book page, filled with beautiful colours, and underneath there was a name … The Whispering Gallery. It sounds like an episode straight from the archives of the Doctor Who, but for comic book writers Leah Moore and John Reppion, the inspiration for a new story about the Time Lord from Gallifrey came straight out of a dream. Leah and John, who live in Toxteth, have been writing comics together for five years. In that time they have built a well-respected reputation in the industry and an impressive portfolio of work. Their latest project is a Doctor Who adventure, produced in collaboration with award winning artist Ben Templesmith and out at the end of February. As Leah explained, finding the story wasn’t easy. Leah said: “Ben contacted us through Twitter (the social networking service) and asked if we wanted to do a Doctor Who story with him, so we accepted straight away. “When we tried brainstorming, John and I were either coming up with ideas that were too big or that had been done before. “Then in bed that night I dreamed I was floating above a double page spread from the comic, which gave me the story, the look, the title … everything. The result of Leah’s dream sees The Doctor and Martha Jones visit the Whispering Gallery on the planet of Grått, where paintings of the dead can speak and emotions have been outlawed. Leah and John are both delighted with how the comic has turned out and said writing a Doctor Who story has fulfilled a long-term ambition. John, who is from Liverpool, said: “We are both fans of the show and a friend of ours, Paul Cornell, has written for the television programme, so it was a no-brainer when this opportunity came along. 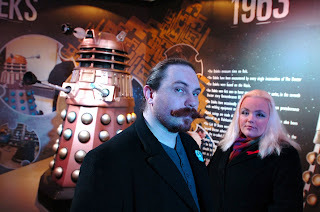 Leah, who is originally from Northampton, said: “It was fun to stick that in and the Doctor is nicely angsty too. He’s got issues, which gave us more material to work with and include. Comic books are in Leah’s blood. Her father is Alan Moore, considered by many to be Britain’s greatest ever comic book writer, who penned Watchmen, which is currently being made into a film, and V for Vendetta. Leah and John, both 30, work together in the spare room of their house, discussing the story ideas together before agreeing on a way forward. Leah said: “When people get our scripts they can’t tell who has written what because we mesh together so well. As writers, they do not draw the comic books as most people usually assume. Instead, their stories are written out from page to page, with instructions and Leah’s thumbnail sketches to guide the artist on the visual structure of the story. Those pages are then sent off for the artist to draw and colour. “People always think we draw the comics,” John said. “Either that or they think we work for the Beano! Leah added: “It’s about the artist understanding where you are coming from and being on the same wavelength. “We don’t expect artists to do things exactly how we say. We want them to translate our notes into the finished work, and quite often they change things here or there, or add something we haven’t thought of. Although the comic book industry in Britain is relatively small, John and Leah agree there are plenty of opportunities for people to get involved in it. John said: “Comic book writer sounds like such an unrealistic job to a lot of people I’d imagine, but we have been doing it for five years now so it is a career. “If you come up with ideas for stories, I’d suggest sending them in to a comics publisher, who are always taking submissions for anthologies. Leah added they still submit stories for anthologies, despite being well established. “People ask us why, but we want to be part of helping people getting a break and it is cool too,” she explained. Apart from contributing to anthologies, there is likely to be no shortage of work for Leah and John in the months ahead. Alongside the Doctor Who comic, they have just submitted the story for a major adaptation, with several other projects in the pipeline. John said: “Writing for comics can be a lonely profession because you work at the end of the phone or over e-mail and don’t get much feedback. “People keep on asking us to work with them though, which is validation we must be doing something right.